Westmoreland Specialty Company grew out of Specialty Glass Company when the business moved from East Liverpool, Ohio to Grapeville, Pennsylvania in the late 1880s. In 1890, the company began producing high-quality glass in pot furnaces at its new factory. In the early 1900s glass containers holding condiments such as vinegar, mustard, and lemon flavoring were made and distributed by Westmoreland. During the World War I era, the company manufactured a variety of glass candy containers carried by newsstands and dime stores. These types of endeavors were eventually abandoned as unprofitable, according to a letter shared on the National Westmoreland Glass Collectors Club website. In 1924, Westmoreland Specialty Company became Westmoreland Glass Company to thwart potential confusion about wares being distributed by the business. Glass was the only product being distributed from the Grapeville factory at that time, and the business wanted to make sure that wholesalers and consumers understood the primary focus of the business. Westmoreland suffered through the Great Depression in the 1930s like the majority of other glass companies and varied businesses, but unlike others, they never ceased production. The company reorganized in 1937 with further funds risked by the Brainard family who had partnered with the West family to operate the factory since the late 1800s. James J. Brainard became president in 1937 and served in that capacity until 1953 when his son, James H. Brainard, became the head of the organization after his father passed away. First made by Westmoreland in the 1920s, milk glass was the most remarkable and prolific product this company manufactured. In fact, they were one of the top producers of fine quality milk glass in the United States, according to the Collector's Encyclopedia of Milk Glass by Betty and Bill Newbound. This includes the ever-popular hen on nest covered dishes, which were first made of more delicate milk glass in comparison to the examples produced from the 1940s on. One of the most well-known patterns of later milk glass made by Westmoreland, while there were a number of them, is Paneled Grape. Text from a marketing brochure published in the Newbound's book notes this pattern was marketed as "reproduction" glass and marked with the WG stacked mark (see link below). Apparently, Paneled Grape was first made at the turn of the last century by another glass maker, but what most collectors find on the secondary market today is the ​later glass which is thicker and whiter in comparison to early milk glassware. While not quite as widely found on today's secondary market as the phenomenal seller Paneled Grape, other popular patterns made by Westmoreland Glass include the Beaded Grape, Old Quilt, and Roses and Bows patterns. Several different paper labels were also used by Westmoreland throughout the years. Most of these wore away with cleaning and use over time, but collectors will occasionally find one still in place. 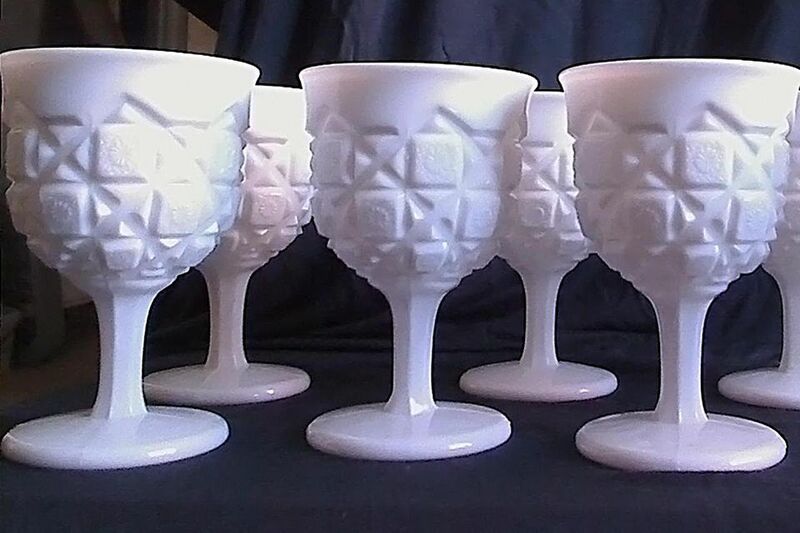 Westmoreland is clearly best known for its milk glass, with 90 percent of the glass produced from the 1920s through the 1950s having the milky white hue. However, in the 1920's the company did make limited selections of high quality decorated glass and crystal, including hen on nest dishes made in a variety of colors in addition to the ever-popular milk glass examples. Even into the 1950s, limited amounts of amber, blue, green, pink, and brown glass left the Westmoreland factory. In 1981 ownership of Westmoreland was purchased by Dave Grossman, according to the National Westmoreland Glass Collectors Club. On May 21, 1984, the Westmoreland Glass Company closed its doors just a few years shy of its 100 year anniversary. The Westmoreland molds were sold to a number of different glass manufacturers including Summit Art Glass, Viking Glass, Blenko, along with several others. Some of the molds are still being utilized today in glass manufacturing.